Well, I have to say that it’s been a while! Sometimes, there’s so much to do in life that finding the time to reflect upon what you’ve done in a blog post doesn’t always work out! If this spring is bringing energy your way that is anything like what I’m seeing, you might also be finding that it’s more work than play. But I’m ok with that. Life is full of cycles, this one just happens to be more work related! This particular smoothie lifted my spirit for a number of days in a row and I don’t know how anyone can say that that’s a bad thing. It felt good. Yet I know, some people like to vary what they consume every day. That’s good. But when I find something I like, I love it when I can stick with it for a few days to really stretch out the positive effects. 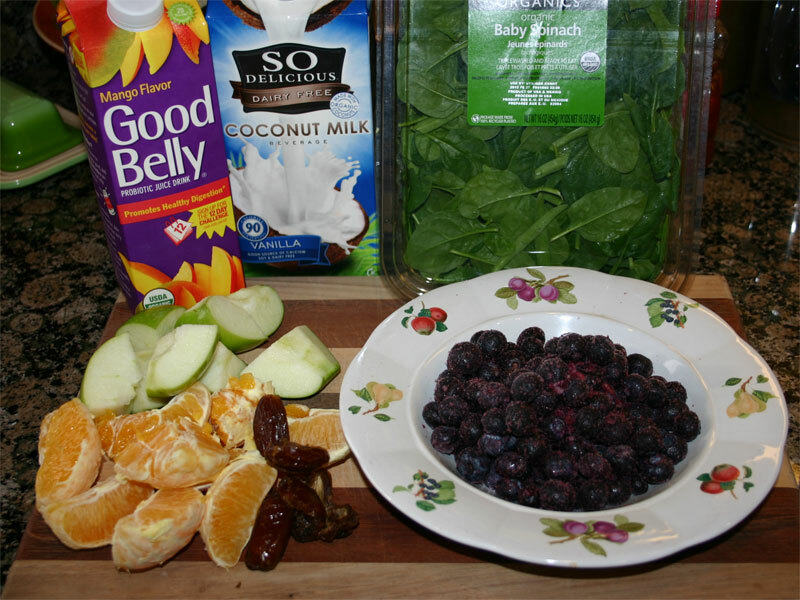 This time, I was lucky enough to have all the ingredients in a ready state to go for this smoothie. When I pause to really thing about this, I believe that the stability and longevitiy of the fruit in this smoothie is what makes this one so easy – everything is ready to go! I can’t quite pinpoint what it is exactly that I love about this one, but it’s chilly (from the frozen blueberries), saucy (from the apples) and full bodied (from the oranges). 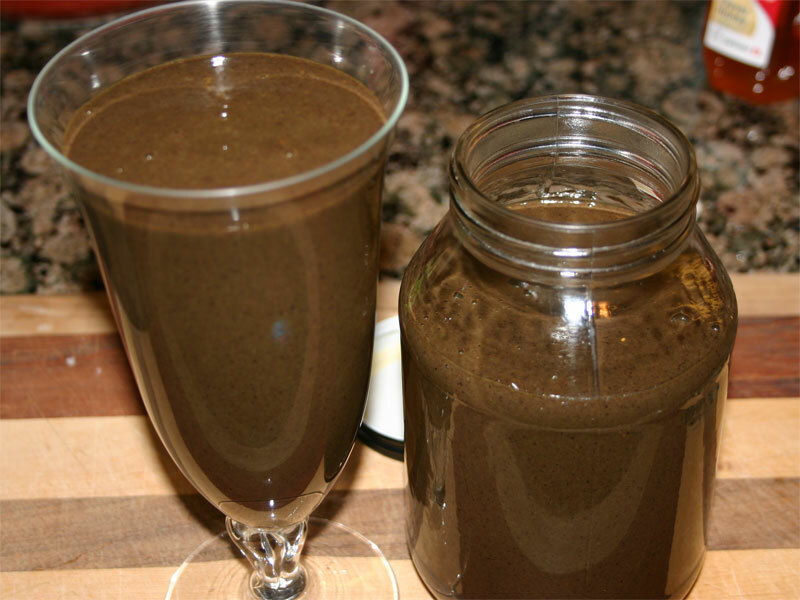 There is a smoothness from the spinach that is offset by the grittiness of the seeds (from the blueberries) that makes it more than a drink and more than satisfying on the tummy. The beautiful thing about these smoothies is that you just toss everything in the blender and let it fly (on high) for 60 seconds or so. The volume and weight from the liquid will easily pull down the light fluffy spinach so it won’t take much to get all this to liquidate. Oranges are for volume – and they are a little cooling so make sure it’s a warmer day if you add more. 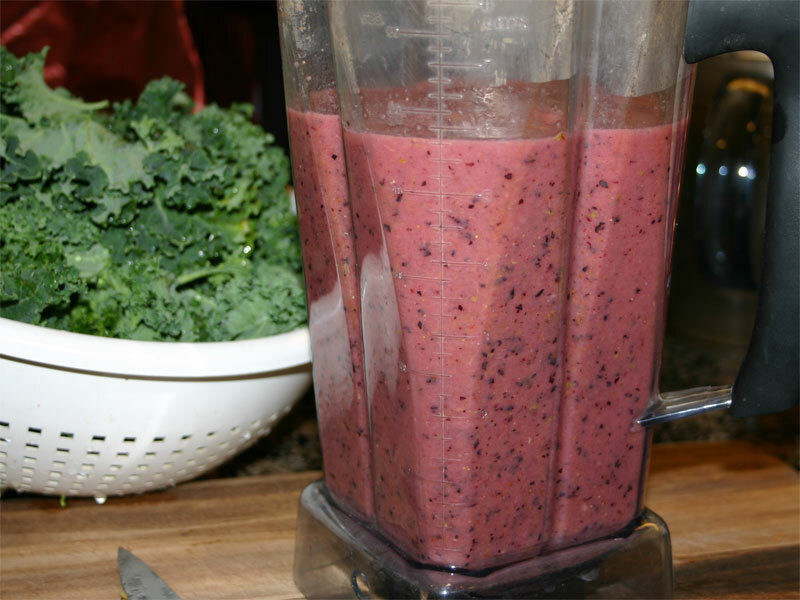 In the end, you’ve got breakfast and lunch – or smoothie to share – which is what I do! 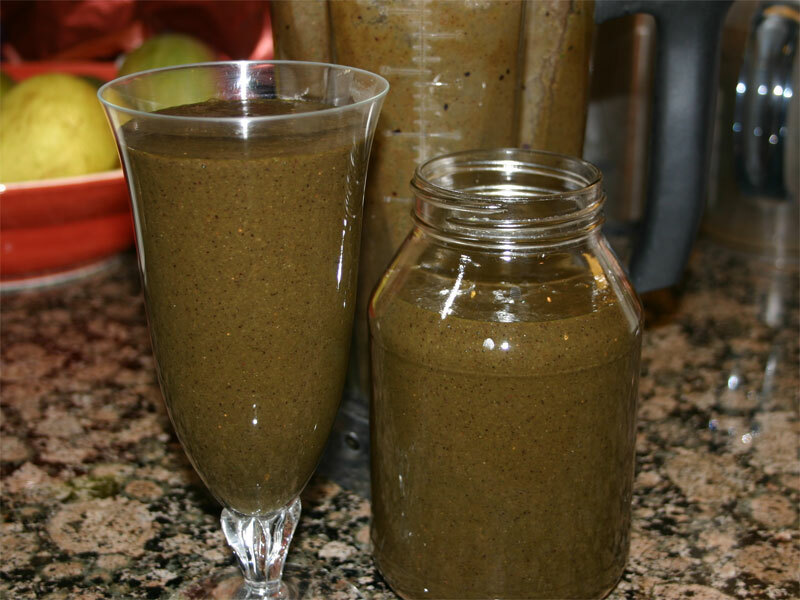 This fruit combination does really well with Swiss Chard, so if you’ve hit your limit with Spinach, you can add in chard and enjoy the combination for another few days! Stay light-spirited – for the moment is what you make of it! You’ll love it, or hate it. I’ll bet that you won’t find a middle ground with this one. It’s bold, heavy and filling – which can make this a meal rather than just a snack. But then, if you can’t tolerate it, the impact will simply be emotional and you’ll quickly look for something else that’s a lot more forgiving. I love it. This is one of my favorite ways to eat kale. The lemon adds the sour, the blueberries add a bold flavor, the oranges add volume, the pear adds texture and the coconut milk adds a mild toner to bring it all together. A Meyer’s lemon is even better than a regular lemon, for it’s not as acidy and it’s a bit sweet. But, this combination might not be for you. 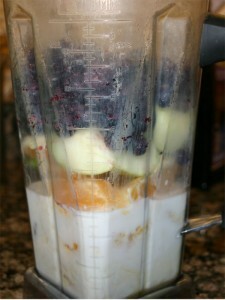 The mixture can separate and setup quickly making it a lumpy surprise – if you’re not on top of it. Some people just don’t like kale. 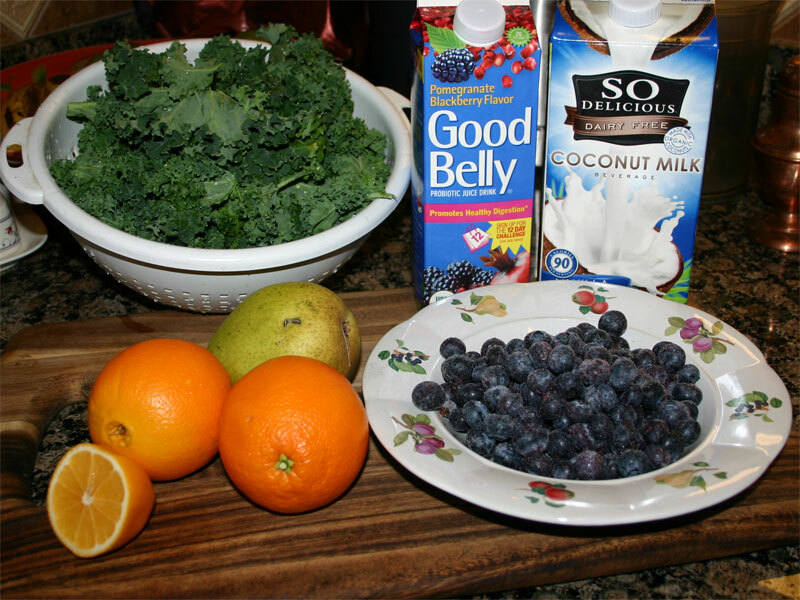 And, well, this smoothie has a big bunch that might push you over the top! Let’s get on with it. I’m finding myself buying more kale lately just so I can make this smoothie. The joy it brings to me adds to my excitement for sharing. Notice that it doesn’t have dates! Kale tastes better if it’s not mixed in a really sweet smoothie. Add all the fruit and give it a spin. Make sure you peal the oranges and remove seeds. With the pear, core it to remove the seeds. 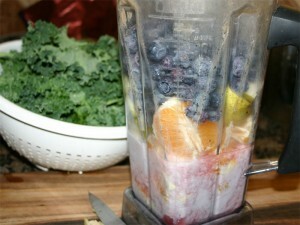 After adding the greens, work them in slowly and then blend on high for about a minute. The frozen blueberries make it easy to run the mixture extra long, for it won’t heat up that quickly. 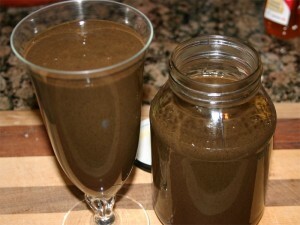 When you’re done, you’ll have 7 cups of a brown sludge like liquid. It tastes a lot better than it looks. Blueberries never really break down all the way so you’ll have specs of blue. You’ll also find bits of green (from the kale) and white (from the pear) that will keep you full for hours. I can’t wait for the kale to start growing again in the garden. What I planted last spring is now about a foot tall waiting for the weather to warm just a little. Once it does, I’ll see the early spring leaves that should really make this smoothie pop! Thanks for visiting! Have a great day.